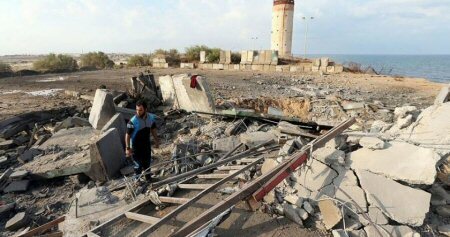 The Palestinian Ministry of Public Works and Housing in the Gaza Strip, on Thursday, said that the recent Israeli military aggression on the besieged enclave resulted in complete destruction of 30 houses and partial damage to 500 others. Deputy minister Naji Sarhan announced, during a press conference, that the estimated losses following the Israeli shelling of homes and civil institutions over the past few days exceeded $2 million. Sarhan accused the Israeli occupation army of deliberately using excessive force, which caused serious damage to residential buildings and civilian facilities. The destruction also affected the surrounding buildings, which led to the displacement of hundreds of Palestinian citizens. Sarhan said that the Israeli military operation in Gaza, in November 2018, left 77 Palestinian houses completely destroyed and 1,170 partially damaged with losses estimated at $5.1 million. According to the Ministry of Public Works, about 2,200 houses of the 12,000 completely destroyed, in the 2014 aggression and earlier attacks on Gaza, have not been reconstructed. Moreover, some 60,000 partially damaged houses have not been provided with the necessary repair funds. Sarhan said that the total funding required for the complete and partial damages is approximately $140 million, calling on the international community and the United Nations to put an end to the Israeli attacks on the blockaded Gaza Strip and to protect civilians and their homes. He appealed to the Ramallah-based Palestinian Authority government to provide urgent funds to temporarily shelter the homeless families, and to contact donor countries to start reconstruction plans.